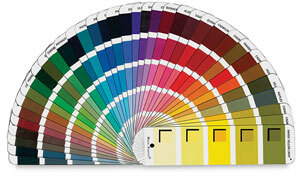 Take the guesswork out of choosing paint colors! This handy guide helps artists and designers identify, match, preview, and select the colors they desire for their paintings by showing them the vast range of color values that can be achieved by adding Titanium White or Ivory Black to 36 of the most popular artist’s tube colors. Each color is shown in a five-level value scale, printed on individual cards with 144 tints and shades. Included are unique viewing windows for easy color and value identification.